A 74 year old lady presented with progressive sore throat and hoarse voice. 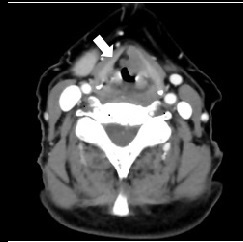 Contrast CT demonstrated a soft tissue mass involving the left vocal cord, extending into the left and right paraglottic fat (Figure 1). 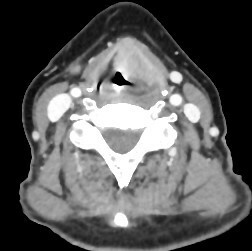 Axial CT showing soft tissue mass as described above. Direct laryngoscopy was attempted but biopsy of the lesion was not possible. The overlying mucosa appeared to be benign (Figure 2). Benign mucosal appearance on endoscopy. A provisional diagnosis of a possible laryngocele was made, given the normal mucosal appearances. Despite repeated attempts, it was not possible to direct a laryngoscope into the laryngeal ventricle to assess the larynx appropriately. Her symptoms persisted and progressed over the following 6 months. Another CT was performed, showing progression of the lesion, with further invasion into the right paraglottic fat (Figure 3). Axial CT- contralateral extension of mass into the paraglottic fat (white arrow). There was no invasion into thyroid cartilage nor into the hypopharynx. Again, biopsy via laryngoscopy was not possible. A decision was made to proceed to Ultrasound to see whether (a), any lesion could be seen and (b), whether a biopsy was possible. The lesion was readily visualized on ultrasound (Figures 4 and 5).